-- Select a Size/Color -- X-Small Small Medium - Out of Stock! Large X-Large - Out of Stock! 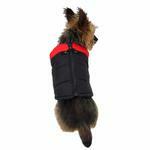 Give your pup style, warmth, and convenience with the Padded Dog Harness Vest by Gooby in Red and Black. 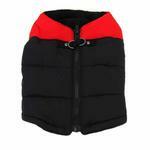 This Red and Black Padded Dog Vest is sure to keep your pup warm throughout the winter! 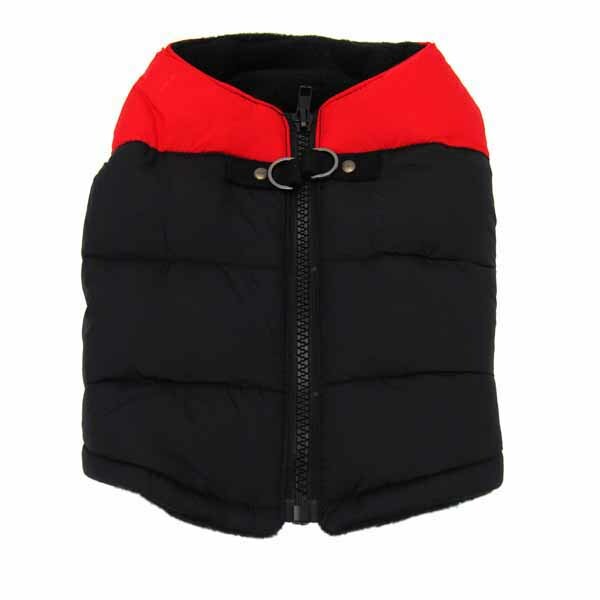 Fully lined in cozy black fleece, this vest has a puffy waterproof outer shell. 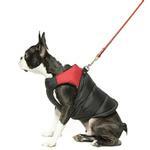 Zipper closure along dog's back with a protective flap behind so no fur gets zipped up. Double D-ring for leash attachment. 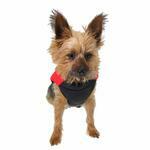 Padded Dog Harness Vest by Gooby - Red/Black Customer Photos - Send us your photo! Ginger used to get too cold in the snow even though she loved to sled. But when I got her this "Gooby" vest for baxterboo.com, it kept her nice and warm so she could play for as long as she wanted! This is Puppia's first winter! She has her new "Gooby" vest to keep her warm while she is having fun in the snow! Posted On 04/07/17 by Anne C from Chicago, IL Yes, Anne C recommends this product! 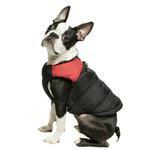 This is a great coat for barrel chested dogs with short body lengths. 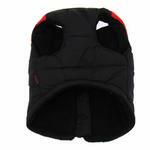 It's comfortable & warm, plus your dog just steps into it, rather than going over the head. And I love the built in leash clips. A real ski parka for a dog! Posted On 11/27/16 by Jen from Philadelphia, PA Yes, Jen recommends this product! My dog looks so cute that I wish I could take him to ski now that he has his parka. Great fit and very easy to put on. Posted On 01/27/16 by Marsha C from Woodlake, CA Yes, Marsha C recommends this product! It looks great on my dog, Marty. He's ready for the snow! Posted On 12/01/14 by Nikki M from pittsburgh , PA Yes, Nikki M recommends this product! Posted On 10/09/14 by Deborah H from Portland, OR Yes, Deborah H recommends this product! This is a very high quality vest. The construction is perfectly stitched, the large zipper is attractive and slides smoothly, the inner shell is very soft. 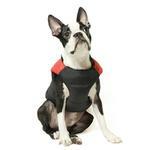 I bought this vest for my dear Nora; she is a 1 year old Miniature Pinscher. Nora is my first rescue dog and she has joined my pack with Abner, the Rat Terrier and Miss Lola, the Chihuahua. I do think this vest runs a little large. I had to return it and order one size smaller. Winter is coming and Nora will need extra protection against the cold and rain. I highly recommend this vest, it is great!